I was very kindly sent these two very beautiful and unique rings from Arrow Divine. Firstly I am a sucker for blue stone rings. This aztec patterned sterling ring stuck out like the perfect sore thumb and I could not resist. Turquoise is a master healer and a stone of yin (feminine) energy. The second is a clear quartz crystal, each having their own imperfections makes each ring unique to you. The Quartz stone is meant to be the most powerful healing and energy amplifier on the Planet. Each item on their site has the perfect description of every piece along with a little bit more about the stones. I got size 6 in the rings and they fit perfectly. The rings are absolutely beautiful!! I had no idea about the healing properties of Quartz so now I'm definitely going to have to go learn more about it. These rings look so niceee, I love wearing rings! 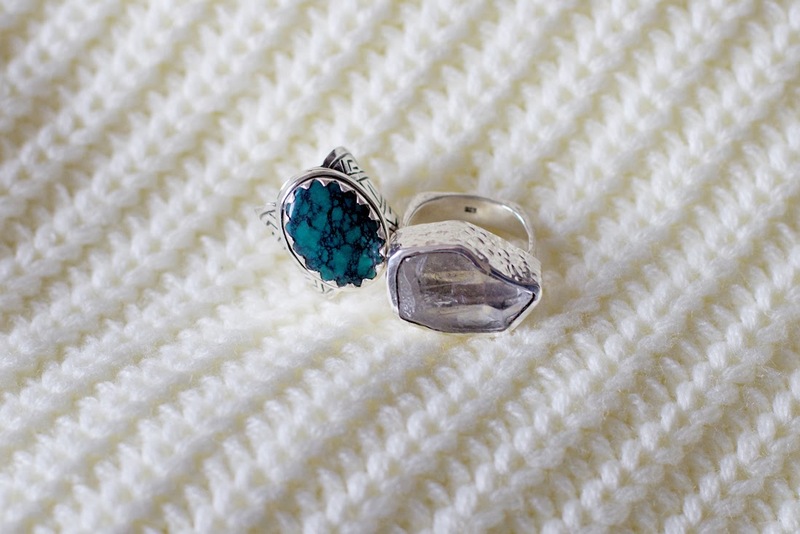 Ooh I love the clear quartz….it's my mission to buy more silver rings this year!